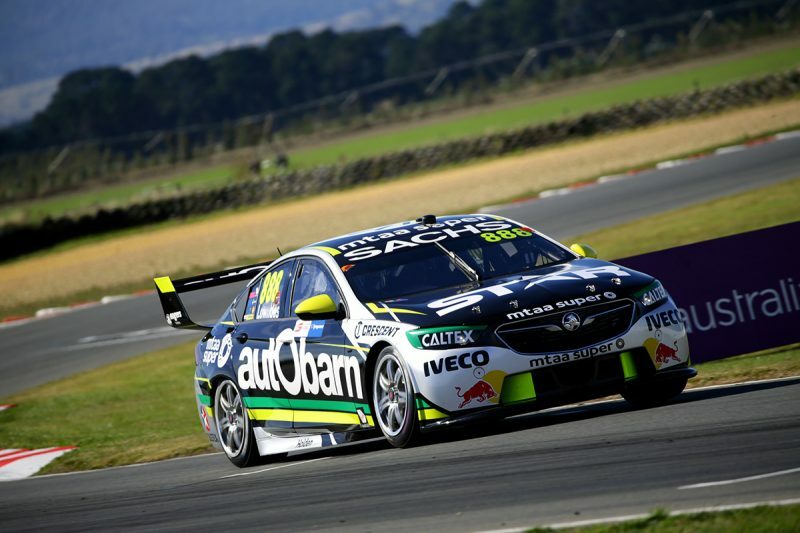 Craig Lowndes has claimed his first Armor All pole position since 2015 ahead of Race 8 of the Virgin Australia Supercars Championship at the Tyrepower Tasmania SuperSprint. Lowndes proved the benchmark throughout the final part of the three-part session, edging out team-mates Shane van Gisbergen and Jamie Whincup to head a Triple Eight 1-2-3. Scott McLaughlin will join Whincup on the second row, while Jack Le Brocq ended the session fifth, one place up from the second Shell V-Power can or Fabian Coulthard. “The car has been working really good over the weekend and it’s a credit to these guys,” said Lowndes. 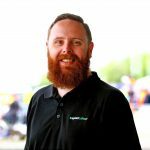 “When you roll it out and it’s sort of 85 percent, 90 percent right it’s a lot easier for us drivers. The guys next door are not going to make it easier for me – that’s for sure. Lowndes joined the session in Qualifying 2, having been second fastest in Sunday morning’s practice session, and immediately showed his credentials. A 50.8794s lap saw Lowndes fastest, though Whincup ultimately held top spot as time ran out in Qualifying 2. All three Triple Eight cars ventured out for just a single run towards the end of the middle phase of the session, a tactic also employed by Walkinshaw Andretti United. Having set his Qualifiyng 2 time on his second time lap, Whincup repeated the process in Qualifying 3 to set a 50.7468s. It moved Saturday’s race winner into the middle of a Triple Eight sandwich at the top of the timing screens, van Gisbergen and Lowndes having already banked strong times. James Courtney ran off-sequence with the rest of the field, setting his first lap with just over four laps left in the session, a 50.8156s time strong enough for fourth fastest, demoting Reynolds and Le Brocq. Scott Pye was on a similar strategy, remaining in the lane until three minutes remained, affording time for just a single run which saw him record just a 51.0092s to lock himself in to tenth. Late in proceedings Lowndes lowered his own benchmark to 50.5790s to edge clear of Whincup by over a tenth of a second. Van Gisbergen came closest, but was 0.008s off Lowndes’ time to confirm a Triple Eight 1-2-3. Earlier, Cam Waters set the early pace in Qualifying 1, banking a 51.1263s after the first meaningful laps. Both Pye and Anton de Pasquale remained in pit lane for the early part of the session, emerging only as the remainder of the field took to the circuit for their second runs. An off from Todd Hazelwood saw the Bigmate Falcon driver run through the gravel at Turn 2, taking out a sponsor’s board in the process before rejoining with no harm done. Pye went to the top of the session with his second flying lap, a 51.0003s lap which saw him just 0.1s clear of both Mark Winterbottom and Tim Slade. The leading six runners all opted to pull in before the segment ended, with nobody able to steal themselves a berth in Qualifying 2. Among those who missed out was Richie Stanaway, who was 14th in the session to confirm himself in 24th for the 84-lap race. Nick Percat also missed out in 11th, while BJR-team-mate Tim Slade found a way through to Qualifying 2. Times immediately tumbled from the opening 10-minute phase, with Scott McLaughlin recording a 50.9680s. Courtney and Reynolds soon lowered that benchmark, though the leading five drivers were covered by less than a tenth of a second with Garth Tander fourth and Le Brocq fifth. Four drivers elected to have a single flying lap, including the three Triple Eight cars and Scott Pye, who’d progressed from Qualifying 1. Lowndes immediately went fastest, a 50.8794s effort pushing Courtney off top spot while Whincup banked a 50.8025s lap on his second timed attempt. Reynolds and van Gisbergen put themselves towards the top end of the timing screens inside the final minute, Courtney dropping to tenth as times tumbled in the closing seconds. Despite falling from provisional pole to tenth, Courtney made it through as Mostert, Winterbottom, Kelly, Waters, Will Davison and Tim Slade all fell by the wayside. It left McLaughlin and Coulthard as the only Ford representatives in Qualifying 3, the balance made up by Holden runners. The result is Lowndes’ 42nd career pole position, his first since Queensland Raceway in 2015. The 84-lap Race 8 gets underway at 14:05 local time.